A life as an EMT, or an emergency medical technician, is a highly commendable career to pursue as these are the people who are on the front lines in medical emergencies and are often the people credited with saving lives. Becoming a certified EMT is the best path to take as this will open many doors for you in terms of finding the best employment in the field. Getting certification as an EMT is easier than you may think, provided that you meet the educational and training prerequisites, which are also easier to adhere to than many people seem to think. Most community colleges will have an EMT study option, so this is a good place to start. The course will be about a year long. Usually you can join one of the above as a volunteer without any EMT training. On the job you will be given basic training and you will get e preliminary look into what you will do as an EMT. If you decide to pursue the qualification, there is no reason to stop volunteering as all the experience you can get will be useful. If you’re looking at online EMT schools, be very, very careful. You need to be sure that these schools, as with any other schools, are accredited by the state in which you want to practice as EMT. Also remember that not all the requirement for an EMT qualification can be fulfilled online. For example you cannot complete the hands-on practice training in an online setting. Complete the coursework and then get your 100 to 200 hours of hands-on experience. Once you have done all of this register to take the required examination (this will also include mandatory physical exams). When you’ve done this, you will be a certified EMT. You will be required to re-certify yourself as an EMT once every four years. Again the rules here depend on the state in which you live, so find out more from your states EMS website. After that you have the option to continue your education and even work your way up to being a paramedic, which comes with many advantages of its own. You will need a driver’s license as an EMT. This is because a big part of your job involves driving. You will need to drive safely and quickly to the place where the patient has been injured. You will then need to prepare the patient for transport and then securely and safely transport them to the nearest medical facility of it is a feasible options. If wounds are minor the patient can be treated on the scene. Whether or not you need to be supervised when performing tasks such as these will depend largely on the rules of your state’s Emergency Medical Services Department. It is helpful to know what you can and cannot do with an EMT-B before deciding to pursue that qualification or a more advanced one. Again, the degree of supervision you need and the exact tasks that you are allowed to perform with an EMT-I qualification depend on the rules and codes of your particular state. Note: The exact number of patient contacts that you have to have before becoming an EMT-II depends on the state in which you work as, once again, there are differing rules form state to state. The exact numbers may differ very slightly depending on where you are training to be an EMT-III. 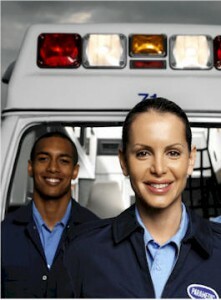 Before you can become a certified EMT you have to complete an EMT training program. In order to qualify for entrance into an EMT training program there are a number of educational prerequisites that you will have to meet. Firstly you will need to have a high school diploma. If you do not have a high school diploma, but you do have an equivalent thereof, such as a GED, you will still be able to enter an EMT training program. After that the prerequisites will differ from course to course. A common prerequisite that often arises is that the course conveners will require you to have a valid cardiopulmonary resuscitation (CPR) certification. In addition they may require you to complete a preliminary training course before you can begin proper training. A willingness to learn the above information, as well as an interest in it will stand you in good stead on your path t becoming a certified EMT. All of the above can be taught, so do not feel daunted by any of the topics mentioned above as you will not be expected to demonstrate knowledge of any of the curse work topics mentioned here before your training is complete. You get three tires to pass the exam. If you fail on try three you will need to do 24 hours additional training before you can take it again. You must apply for re-certification once every four years. The path to becoming an EMT is a little shorter than many other paths to enter the medical profession. As an EMT you will have a steady and stable job as there will always be medical emergencies that will require the knowledge and expertise of trained medical professionals. In addition you will be remunerated fairly well throughout your career, and you may have the option of pursuing more advanced careers and qualifications within the healthcare industry from the starting point of an EMT qualification. As you can see becoming a certified EMT is not nearly as difficult as one may think. The steps require hard work and motivation as well as dedication on your part, but provided you are serious about becoming certified in this line of work, you will have very little trouble achieving your aims.